It is easy to get caught up in our busy schedules. How often do we stop to acknowledge the simple greeting or smile of the person waving at us who just may happen to have an intellectual disability? Better still, have you considered being an advocate to ensure the protection of their rights and freedoms? 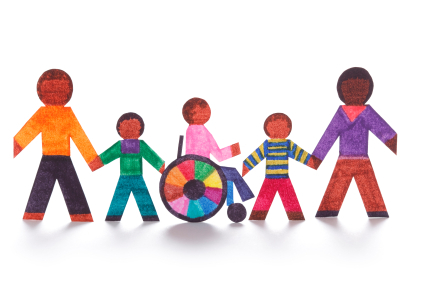 Disability inclusion is defined as including people with disabilities in everyday activities and encouraging them to have roles similar to their peers who do not have a disability (Center for Disease Control and Prevention). It is vitally important to provide access to public resources and social interactive opportunities within the community. According to the American Association on Intellectual and Developmental Disabilities (AAIDD), an intellectual disability is characterized by significant limitations in both intellectual functioning and adaptive behavior which covers many everyday social and practical skills originating before the age of 18. Intellectual functioning, known as intelligence, refers to general mental capacity such as learning, reasoning, and problem solving, etc. Intelligence may be measured by administering an Intelligence Quotient (IQ) Test in which a person solves problems (AAIDD). An Intelligence Quotient is a number representing a person’s reasoning ability compared to other people their age. The average person may score 100, while a person with an intellectual disability may score from 70 to 75. Adaptive behavior is the collection of conceptual, social, and practical skills that are learned and performed by people in their everyday lives (AAIDD). Conceptual skills include language, literacy, money, time, number concepts, and self-direction. Social skills refer to interpersonal skills, social responsibility, self-esteem, gullibility, naivete’, social problem solving, and the ability to follow rules, obey laws, and avoid victimization. Practical skills are defined as activities of daily living and personal care, occupational skills, healthcare, travel and transportation, following routines, use of money, and use of communication devices like a telephone. It is up to each of us to remove barriers that limit the life experiences and fulfillment of those living with intellectual disabilities. These barriers may include the way we communicate using technically difficult language as well as our individual and collective attitudes towards them. We must be careful not to make disrespectful, stereotypical generalizations or laugh at jokes targeting this diverse group. Together we can work to eliminate negative stigma, prejudice, and discrimination. Sometimes it is assumed that persons with intellectual disabilities have a poorer quality of life or they will not be able to excel. By providing early interventions and individual accommodations within the educational system, full potential may be realized and perceived limits may be exceeded. The Individuals with Disabilities Education Act (IDEA) is a federal law allowing children with disabilities to have access to public education that is appropriate to their needs. When a student with special needs turns age 18 in Texas, guardianship rights are transferred to the adult student unless a court document is filed for parents to be a legally appointed guardian per Notice of Procedural Safeguards (see references). Destination DFW lists several educational resources for parents on their website (see references). As a community-at-large, our aim should include addressing the level of functioning of individuals with intellectual disabilities by meeting their needs as a matter of social responsibility versus forming harmful opinions and discouraging outlooks for their future. Support local organizations who are closing these gaps by providing services. Building coping skills and resiliency in persons with intellectual disabilities is key and this support may be found through individual and family counseling throughout transitional stages of life. LaNesha R. Creeks, M.A., LPC-Intern is completing her internship at Harmony Counseling Center. She has a teaching background in special education serving students with special needs, learning disabilities, and emotional issues. She is certified as a school counselor. I really want to use the same image as you have used for promo of an inclusion forum we are holding- i cant find any accreditation anywhere- where did you source it from?